Rail technology leader Bombardier Transportation is celebrating the launch of an Independently Powered Electric Multiple Unit (IPEMU), which can be driven entirely by battery technology, in addition to drawing power from its pantograph. 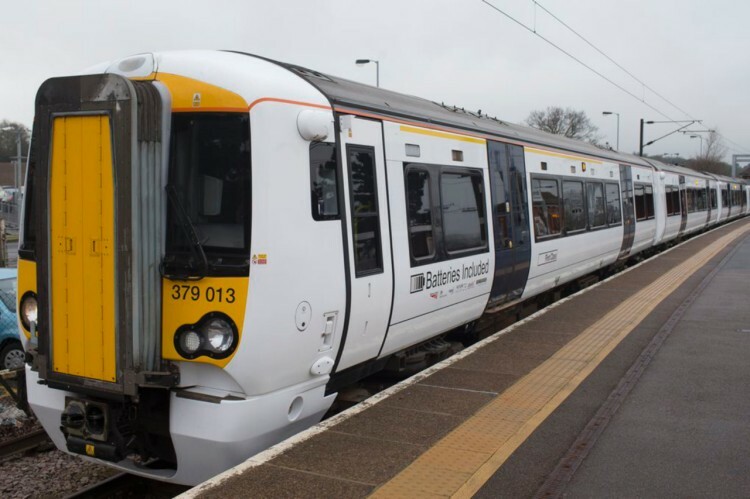 Modified from an existing Stansted Express Class 379 ELECTROSTAR electrical multiple unit (EMU) train, the upgraded train is part of a research program partly funded by Network Rail and the Rail Executive arm of the Department for Transport. Working with industry stakeholders during a 7-month design phase, Bombardier reconfigured an ELECTROSTAR Class 379 train to enable the installation and integration of an operational traction battery system. The alteration required engineers to modify the carriage creating the necessary space in the underframe to accommodate the lithium iron magnesium battery cells. Engineers also added high voltage and communications cabling, standard safety features and battery controls as well as integrated the traction and train control management systems. The new design uses existing line converter equipment to charge the batteries and connects the motor converters to the batteries when the 25 kVAC overhead line is not available. In addition to its low noise and reduced energy consumption, battery operation’s main benefit is that it enables the train to cross non-electrified lines or can be used in the event of electrical failures without using overhead wire systems or diesel power. They can also use branch lines where it is not cost-effective to install additional overhead electrification as well as expanding rolling stock capacity by increasing the flexibility of existing diesel powered trains. After a phased approval process and dynamic track testing, the train entered passenger service in January 2015 as part of a trial. Hitachi Buys Finmeccanica Rail Asset: AnsaldoBreda and Ansaldo STS What is a Train Control and Monitoring System (TCMS)?